Armour Group is a major British hi-fi distributor, and owns a number of UK brands including Goldring. About seven years ago, the company decided it wanted a speaker brand, and duly created its own. Rather than building a factory and hiring designers on the payroll, it did what so many do today – which is hire a designer and find an OEM manufacturer in China. Happily, the person taken on was Karl Heinz Fink, who has a history of fine sounding speakers stretching back to the late nineteen eighties. All his designs sound smooth, warm and highly musical. Fascinatingly, this is the case regardless of what technologies he uses; he’s a wizard with BMRs for example, yet the Q Acoustics 2050s don’t have a BMR in sight, yet still sound smooth, warm and musical! Karl Heinz is a big vinyl fan, owning some really exotic turntables like EMTs, and also loves valve amplification. Steve also has an exceptionally good ear, and together they voiced the 2050 after Karl Heinz first engineered it. 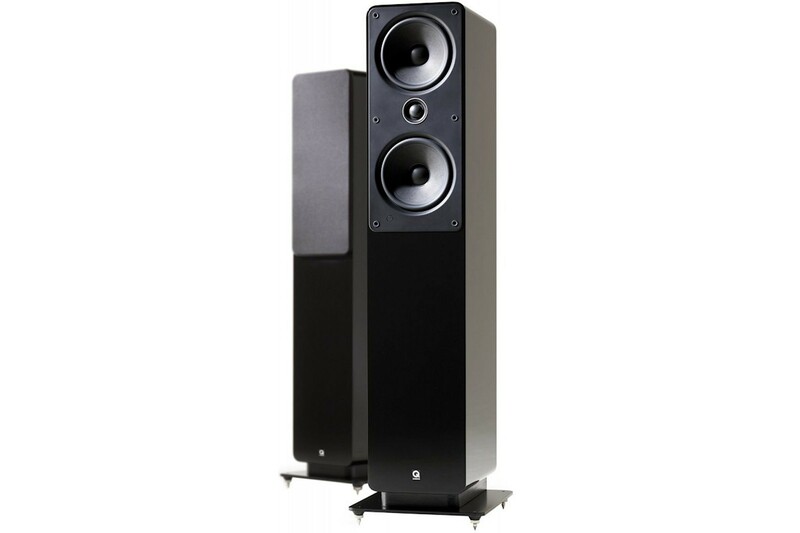 No surprise then that this quite large floorstander offers an amplifier-friendly 6-Ohm impedance and 92dB (claimed) sensitivity, ideal for valve or low powered Class A amps, nor does it come as a shock that it delivers a big, spacious, gentle sound. The largish (1006x270x321mm) and heavy (21kg) 35 litre box of the 2050 sports a 25mm dome tweeter which works with twin 165mm, coated paper mid/bass drivers, crossing over at 2.6kHz. The cabinet is steel-braced MDF with an integral spiked steel plinth. It is reflex ported, with a foam bung supplied for those using the speaker close to a wall. As standard it came in black or walnut vinyl finishes, but Piano Gloss White offered for £130 extra. Infuriatingly, the speaker binding posts are positioned underneath – which looks great but is fiddly. The original 2050 came out in 2009 for £350, but was updated a couple of years later with the £420 2050i. This used slightly different drive units – the paper cones were coated with carbon-fibre/ceramic instead of paper/mica. The original 2050 was a revelation at the price, with unexpected levels of refinement allied to a musicality that you wouldn’t expect from something twice as expensive. It sounded big and effortless, and on the end of a smooth valve amp things would be sweet and sumptuous – quite unlike many harsh, thin, forward speakers of its time. Imaging was very good, and it projected well yet knew when to hang back too. In absolute terms bass was stodgy and the high treble rather diffuse and lacking sparkle, and the midband seemed a little opaque, though. Generally it handled dynamics well, but did squash the loudest transient peaks a little and you could hear the cabinet smearing the timing somewhat. The 2050i that followed improved things a good deal, with a punchier, tighter sound and better focus – it was exceptionally good for the price, and still is. You would never call the 2050 a brilliant loudspeaker, but it is a good one that sold for the same money as a lot of disasters. By being so cheap, it let cash-strapped buyers get hold of a big, powerful floorstander for the price of a mediocre standmounter. Because it has just replaced by the new 3050, the 2050 now becomes a brilliant second-hand bargain, especially if you’re looking for something to partner with a low powered amplifier. The best variant is the White Gloss 2050i, which won’t cost much more than £250 mint and boxed. For me, it’s the modern equivalent of the Mission 752, a comparison that I’m sure that Messrs Fink and Reichert will take as compliment!